Browsing for posts tagged sparkling. 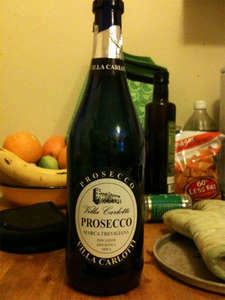 When at a friend’s the other night we were pleasantly surprised by this prosecco. For those who don’t know, prosecco is a generally sweet and slightly sparkling white wine which originated in Italy. This particular bottle was only slightly sweet with a subtle dry after-taste, without the syrupy sensation some sparkling whites (and especially prosecco) can have. It was also exciting to learn it came from Trader Joes for a low price. A good find!